A dog with a missing eye takes a bird to his cave to tend to her burnt wing. But Magpie whispers, I will never again be able to fly. She is filled with grief, but eventually Dog convinces her to climb on his back. He runs through the scrub, and she loves the feeling of the wind streaming through her feathers. They run every day, through Summer and Winter. She says, I am his missing eye and his is my wings. Then Fox sees them. Dog welcomes him into their cave, but Magpie is suspicious. While Dog is asleep, Fox tempts Magpie into getting on his back and running with him. He runs faster than Dog, and it feels wonderful to Magpie. Then he leaves her alone under the scorching sun, far away from Dog. She is suddenly filled with despair and is ready to die. But then she thinks of Dog, and she begins the long journey home. Ron Brooks powerful pictures starkly illustrate this Australian story. It has the feel of an ancient myth, and it deals in universal themes of friendship, temptation, loss, betrayal, and love. Children may find the story uncomfortably adult and harsh, yet it might speak directly to their own experience. 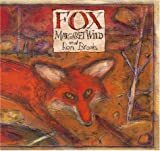 Fox is a surprisingly powerful and somewhat disturbing picture book; parents should certainly read it first before deciding to give it to their children.